“The corned beef is exquisitely done and as tender as a young lady’s heart, all owing to my skilful cookery; for I consulted Mrs. Hale (Sarah Hale’s cookbook) at every step, and precisely followed her directions. To say the truth, I look upon it as such a masterpiece in its way, that it seems irreverential to eat it. Things on which so much thought and labor are bestowed should surely be immortal…..” Nathaniel Hawthorne (1844), fending for himself while his wife was away. Well, Tuesday was the day to get the beef into the corning brine and as planned I will use just about the last of 2011 piece that was sealed up in a food saver bag and stashed in the freezer for what seems to have become a tradition on corning day, Reuben sandwiches with a mellowed out sauerkraut and a quick tangy Russian dressing made with yogurt, grilled on the Griddler and served with juicy dill pickle and sweet potato fries. 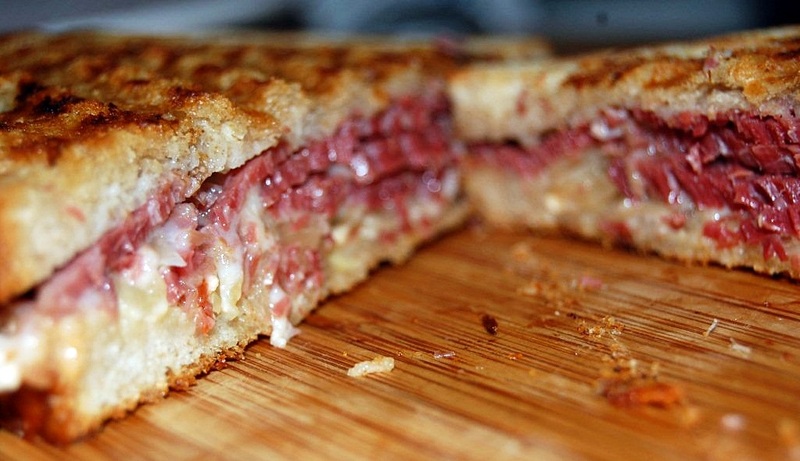 Butter 4 slices of rye bread (butter side out for grilling) and spread a little grainy mustard on the insides of the bread, stack corned beef, a little dressing, sauerkraut, cheese slices, and a bit more dressing. Heat a griddle or pan and grill until both sides are toasty. I served sweet potato fries and garlicky dill pickles…Yummy dinner for corning of the beef day! Sauté pancetta in a teaspoon or so oil, add diced onion just before the bacon gets crispy, stir until onions are soft, add a splash of white wine (Riesling), sauerkraut, caraway seeds, and pepper. Add ½ cup water and simmer for 20 minutes check liquid level and add more water if necessary and simmer for another 30 minutes.